As a working musician making sure you have the right tools for the job is important, after all these tools form a vital element of your employability. Equipping yourself with well thought out purchases can save time, money and stress in the long run. Gear transportation is one of the areas that needs careful consideration. 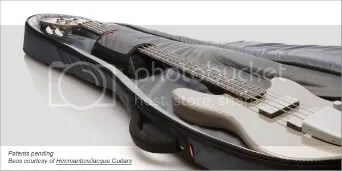 While protecting your instrument is an important, heavy hard cases can become a real pain during daily use, necessitating extra trips to the car for example. This is where a quality, solid and dependable gig bag can really pay off. During my career I have owned quite a few gig bags, made by various companies including: Mooradian, Sadowsky, Incase. My latest gig bag of choice is the Mono M80. This gig bag, made by the Mono Case Company, is highly attractive and well built. Important consideration to the working player has been made. Important features including internal ABS plastic reinforcement, steel riveted handles and most importantly a waterproof coating are standard. This coupled with its light weight (5.75lbs, light considering the protection the case offers) is why I decided to give it a try. As a busy bass player, with a hectic teaching and playing schedule this bag has been fantastic. In a market over crowded with products the Mono Case Company have really though about what a player would want from a case. The bag is made up of the sort of materials that are used by SWOT teams and Navy Seals. The stitching is faultless and feels very strong, the case has hard rubber piping to protect the edges. In fact this piping, along with the rubber bottom (to stop strap pin damage and increase bag longevity) is the stuff they make Navy Seal rafts out of! The exterior is also waterproof. This is one of the few waterproof bags available, many others are only water resistant. This causes problems for musicians like my self who regularly use trains and walk in a country where it seems to rain more than it doesn’t. Getting caught out with the wrong bag could be a costly mistake. The memory foam straps are very comfortable for long walks, for example getting round London using the tube. The bag has a rigid frame (made of ABS plastic) and a plush interior. There is a neck brace to help the instrument from moving around in the case and it offers much support. I really wish more manufacturers would include this feature. The fit feels safe and snug for both my Sadowsky jazz and Lakland 4-94 basses. There is also plenty of extra padding where it matters tops things and this off nicely. The Mono case has a good main accessory pocket, it could be bigger, how ever my experience with an Incase Tour bag means I appreciate that too much space can mean you carry too much weight. This is not only uncomfortable, but can also make some gig bags feel unwieldy and unbalanced (to carry more items I may think about the Mono Producer bag). There is a second smaller pocket at the top, it’s great for phones, credit cards, ipods and pens. It’s also hidden from view to extent, a good thing for urban travel. 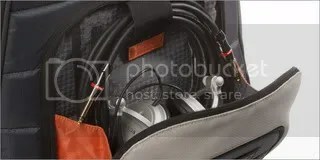 Visually it is a striking and smart looking bag, perfect for busy gigging musicians that want to carry round their prized instruments in safety and style. 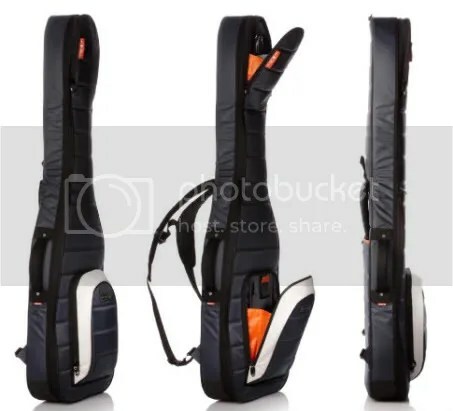 I like it so much that I am considering buying the Mono case double gig bag (M80 2b) for when one bass is just not enough.